Abracadabra is a recording that defies an easy description due to the complexity and variety of the contents. Think of an audio kaleidoscope where things change not only between songs but often also within them. Some of the songs, such as Saltos en la Escalera, Abracadabra and Oba Iré, are redolent of the legendary Jazz/Fusion group Afrocuba with which Oriente López worked in the past; there are stong Brasilian influences in Caido Amargo and Herida De Pena (Oriente plays some accordion on Herida); there is Cuban Funk mixed with a variety of things in El Dulcetero Llegó and Aterriza; El Alma Del Jardín and Pasáste Por Aquí are beautiful ballds; Peregrino is a nice mix of Nueva Trova and Son; El Fin, El Mar a strong Rock Canción and Arrollando El Carnaval a lively conga. But all of this oversimplifies the songs. Throughout the recording, there are flourishes of other things - a touch of Jazz here, a flourish of flutes there, and something unexpected here and there. 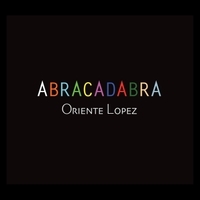 Oriente López composed and arranged all the music in the recording, but the lyrics were written by Ana Mireles (Oriente mentioned in a recent interview that he prefers to have someone else write lyrics for his music). As you can see from the track list, an extremely impressive collection of vocalists collaborated in this project. I did not list the studios involved in the credits because there are several, and the liner notes don't associate them with corresponding tracks, but several independent studios were also involved in the project. Abracadabra was nominated in the Fusion category in Cubadisco 2017, and if you have to give it a label, that is as good as any. Much of it is very danceable, all of it is very listenable -especially if you like the little musical surprises that jump up repeatedly, just like in a good kaleidoscope. I'm not going to include a clip in this review because as I said earlier, in this case a single track would not do justice to the whole.